A: Do you know a good curry-restaurant? B: Huh? Why? You said you loved ramen last time. A: Yes. But I'm into curry now. 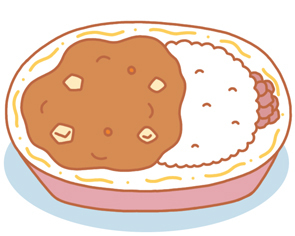 Japanese-curry is great! B: If that's so, why don't you try 'curry-ramen'? A: Oh, it's perfect! Where can I eat it? オマケ　"Why don't you learn English at MCS?"